Need a large Frigidaire upright freezer? May be you should check out the Frigidaire 21 Cu Ft Upright Freezer model # FFFH21F6QW. Here’s are 16 reasons it’s fast becoming a customer favorite. This is one of the largest upright freezers on the market today. With a humongous capacity of 21 cu. ft. (20.5 cu. Ft. to be exact), it’s a wise choice if you have a large family or if you want to make the most of bulk purchases and save money. If the mere mention of the word “defrost” makes you yawn, read happily on. The Frigidaire FFFH21F6QW is a frost free upright freezer so it does all the hard work to prevent that annoying ice build-up. If you currently own a manual defrost freezer, stand warned that this freezer will free up your time, big time. So go find yourself a new hobby. Or you can plan on watching the NCIS, The Big Bang Theory, or Scandal omnibus episodes you missed. Looking to cut electric bills without sacrificing modern luxuries? 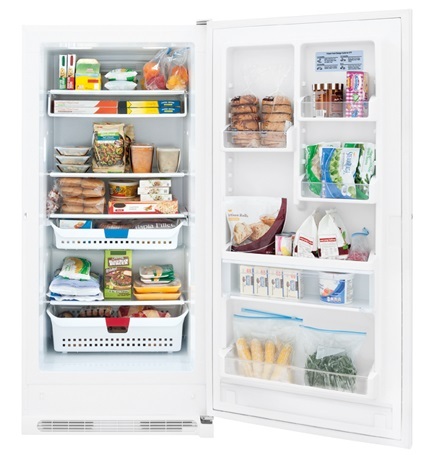 The Frigidaire 21 Cu Ft Upright Freezer is a great choice. That means that operating this freezer for an entire month will cost you less than what two Caffe Misto grandes cost at Starbucks! This is because it’s over 24% more energy efficient than models that were produced just two years ago. So it is something of a shining star among Energy Star freezer models. Nobody wants a shocker of an electric bill when they get a new appliance, however good it looks. So Frigidaire have you covered on this score as well. How’s that for getting the best of both worlds? When you can organize your freezer to fit your needs, life is easier and more fun! Here is the range of options you can expect from this Frigidaire 21 Cu Ft upright freezer. The 3 shelves in this upright freezer are made of glass which adds a nice touch of class. And the shelves are adjustable. This is an excellent feature because you don't have to force awkward-shaped items—or something that's just a tiny bit too tall—into a rigid space that is pre-determined by the manufacturers. Just move the shelves up or down, and store everything neatly and easily. That way, taller items can have their own spot, and won't be in the way. The freezer comes with dividers, too, which are handy for customizing your shelf to store titbits of food. The Frigidaire 21 Cu Ft upright freezer’s baskets add another storage option. And they are adjustable, too. So you can move everything around to get the design and layout you're looking for. No more hunting for things in the back of the freezer, or finding that fuzzy ice-ball of whatever-it-was that's been buried in some basket since last year. The baskets are heavy duty, too. So they won’t buckle even when they’re brimming with food. Frigidaire’s proprietary food organization system comes complete with color-coded clips. That makes it possible to have different color codes for fruits, meats, dairy and hard cheeses. Or for different days of the week. Or for storing food by purchase dates. So organizing your food and even meals is just a clip away! The Frigidaire 21 Cu Ft upright freezer model has 3 clear adjustable door bins and 1 full width door bin. The latter’s big enough to hold a couple of frozen pizzas right in the box! Don't you hate it when your ice cream morphs into a big, frozen brick? The zone stays just a little bit warmer than the rest of the freezer. 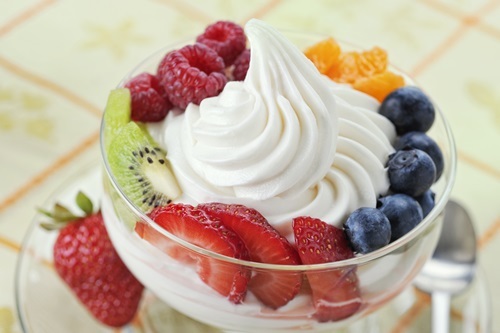 And, it's perfect for things that have to stay frozen, but still need to remain a little soft—like ice cream or yoghurt. This upright freezer’s alarms will sound when the interior temperature rises above the safe threshold or if the door is left mistakenly ajar. Either will alert you to take remedial measures to prevent your food from going to waste. With the freezer’s thicker walls—thanks to Frigidaire’s Arcticlock (TM) technology—food can stay frozen for up to 2 days after the power goes out. Just don't open the freezer, and you'll have a good chance of keeping your food fresh during the power outage. This alone can save you hundreds of dollars, since you won't have to throw away a bunch of spoiled food. Want to join the ranks of uber-patriots? Get this freezer! It’s designed, engineered, and assembled in the USA. Besides helping the American economy get back on its feet, you'll get a freezer that looks and works great. Frigidaire builds appliances that are proven to last for decades and this frost free upright freezer’s no exception. Frigidaire has an enviable repeat customer rate as people often get hooked to the Frigidaire brand. If you’ve never owned a Frigidaire appliance, you’re missing out and it’s time to join the legion of raving fans by getting hold of this freezer. The indicator light tells you right away if the Frigidaire 21 Cu Ft upright freezer’s power's on. So you'll always tell if it's working, without plugging your ear to the appliance or opening it to make sure your food is not quietly thawing away. If you believe that "simplicity is the greatest elegance," you really need to take a closer look at this freezer. It’s got a white cabinet and a white metal handle. White is, of course, a great color if you want to keep the freezer squeaky clean. It’s also quite stylish and will blend in well with most of the kitchen cabinetry. And it won’t darken your kitchen. There are many reasons to opt for a lockable freezer. Key among these are preventing pilferage, and ensuring child safety. But what’s the point of having a key that you are going to forget in the freezer anyway? Fortunately, the guys at Frigidaire have figured this one out as well. 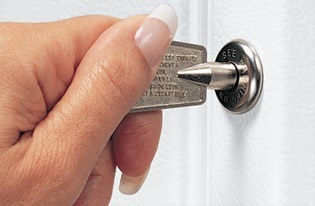 They don’t just make this upright freezer lockable, they make sure the key literally pops out (with a sound), which ensures that you won’t forget and leave the key in the lock. Some freezer brands are notorious for making whistling or groaning noises they are scary. And some are so loud, they are virtually guaranteed to wake the baby. Not so with the Frigidaire FFFH21F6QW. It runs so quietly you'll barely know it's on, so it won’t be a source of noise pollution in your home. This Frigidaire 21 Cu Ft Upright Freezer has digital controls. The control panel is located at the top of the door, on the front exterior. This makes it easy to set, read and adjust your temperature whether it’s arctic tundra or just cold enough. And the digital panel can let you set the temperature in Fahrenheit (F) or Celsius (C). Cool, right? Farewell mechanical controls. It's a brave, new digital era! This freezer model comes with 2 adjustable legs for leveling it out on your kitchen, basement, or garage floor (as it’s free standing, you can place it anywhere there’s room!). With the freezer, manual, Styrofoam, straps, box and all, it weighs in at a considerable 196 lbs when it’s ready for shipment. So it’s definitely a good idea to decide where it will be placed before it arrives. That way you don't have to move it around—and risk breaking your back. If you want the nitty-gritty, it measures 72-3/8" high X 34" wide X 27-1/2" deep, and is 62-1/8" deep with the door open 90 degrees. Plus, you need to leave some wiggle room to allow the freezer to breathe. This Frigidaire upright freezer has interior lighting. The benefits? You can clearly see what’s in your freezer and find what you need quickly. No arctic exploring needed with this freezer as the light is bright enough. The icing on the cake is the manufacturer’s one year warranty on parts and labor. For an entire year from the date of purchase, defective parts and the effects of defective labor that existed at the time of purchase will be remedied at zero cost to you. So more peace of mind here, too, as Frigidaire stand solidly behind their product. Remember though that this freezer model is certified for household use only and using it for commercial purposes will void the warranty. People love this freezer, especially if they're looking for something that gives them maximum storage capabilities at a very low maintenance cost. With the roomy interior, the ease of moving the bins and shelves around, and the automatic defrost system, you won't have to do anything but put food in the upright freezer and take it out. Everything else takes care of itself. It's just one more thing in life you don't have to worry about, so you can focus your energy on more important things that really need your attention. It’s a silent operator yet you'll have peace of mind in knowing that this Frigidaire freezer will protect your food and the hard-earned money you used to buy that food. All these benefits while keeping your electric bill unbelievably low. That's a winning proposition that's hard to beat, and a great reason to go Frigidaire on your freezer quest!